A styling proposal for the Infiniti FX has surfaced from the United Arab Emirates. 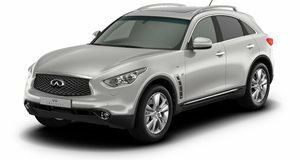 Tuning projects from the UAE don&apos;t normally register on our radar, but this particular example, based on the Infiniti FX, has managed to surface. Created by the firm Matdes, a tuner that specializes "in creating distinctive individualization design programs for the Infiniti FX," this recent project is made up of a comprehensive selection of aerodynamic parts such as a new vented hood, redesigned front bumper and grille assembly, and front apron with LED lights. Also included are a wheel arch extension, side air vent, headlamp and taillight trims, side sills, and a rear bumper with diffuser and reshaped tailpipes. Completing the transformation is a new set of larger alloys and an assortment of body color wraps.